Do I need a plumber to install my V-5 Countertop? How long does the V-5 Countertop last? How do I replace my V-5 Countertop when it is used up? How does the V-5 Countertop work? Click here to view the V-5 Countertop Water Filtration System. Simple to install, the Vitasalus V-5 Countertop is a portable system that can be moved easily to any location. This filter comes complete as one filtration system. There are no filter cartridges to change or replace. Simply connect the V-5 to your kitchen faucet, and use it for up to 5 years. After the V-5 is used up, simply swap out and replace the used V-5 with a brand new one. No. The V-5 is simple to install and comes complete with all necessary installation instructions and parts. The unit is designed to last for up to 5 years or 5,000 gallons, whichever occurs first. The saturation of the media may occur faster in different areas depending upon the condition of the water. Generally, it is recommended that the unit be replaced when there is a noticeable drop in water pressure and/or return of off-tastes or odors. There are no filter cartridges to change or replace, simply connect to kitchen faucet, and use it for up to 5 years or 5,000 gallons. Since there are no filter cartridges to change or replace, after the filter is used up in approximately 5 years or 5,000 gallons, simply swap out and replace the used V-5 (whole white unit) with a brand new V-5. NOTE: There are no filter cartridges to change or replace. The V-5's premium water filtration media, multi-stage and patented dual-chamber flow design maximizes contact-time and contaminant removal and/or reduction for a capacity of 5,000 gallons or up to 5 years. The V-5 Countertop water filtration system is designed to addresssediment and/or particulate matter, VOCs, chlorine, chloroform, benzene, pesticides, lead, iron, tastes, odors and hundreds of other potential contaminants and harmful chemicals that may be found in our drinking water. 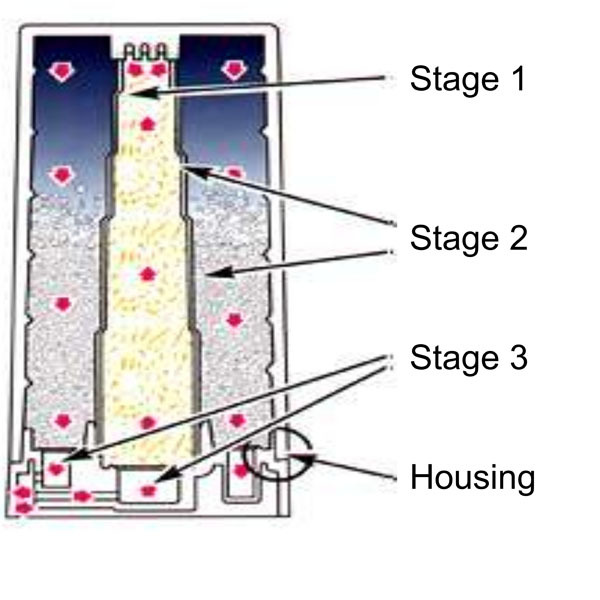 Please see the diagram below for more detailed information regarding the V-5's advanced filtration process. A special kind of activated carbon that combines the absorption-rate capabilities of traditional carbon with the enhanced properties of catalytic carbon. This combination does a better job of filtering an organic compound like Lindane (a common pesticide). The results are a healthier and more flavorful water. A superior blend of bituminous coal-based activated carbon--plus the patented ATS ceramic-sorbent media--reduces lead, iron, chlorine, and odors while producing pure, natural-tasting water. The patented dual-chamber flow design directs water upward through the inner chamber and then downward through the outer chamber for maximized media contact effectiveness. Housing elements are ultrasonically bonded to eliminate the use of adhesives, solvents, or seals. This process is healthier, safer, and better for the environment.